Why is it more expensive to build a smaller home? Home buyers often wonder why it costs more per square foot to build a small home. Below are 12 reasons why small homes cost more to build, along with cost-cutting suggestions from a Raleigh custom home builder. Each of these factors contributes to the overall cost per sq ft of your new home. 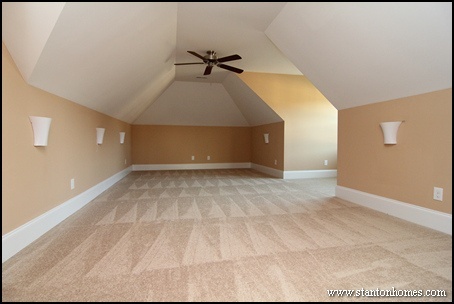 Build up, not out - bonus room space is often the cheapest sq ft in the house. 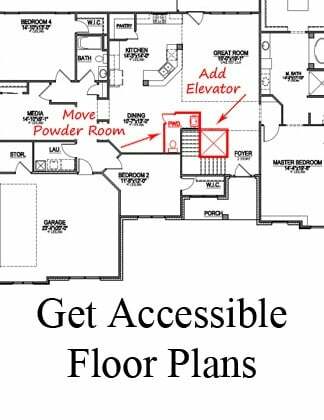 See how your builder can add a bonus room to a one story plan, here. There are two bedrooms and a bathroom upstairs, across from this bonus room - an example from a version of The Scottsdale. Kitchens are the most expensive room of the home - with cabinets, counter tops, hardwood or tile flooring, plumbing, faucets, appliances, and so much more - that makes your kitchen also the most useful room of the home. If your floor plan has an oversized kitchen, consider balancing out your square footage allocation to reduce the overall cost per sq ft.
Peninsula kitchens are generally smaller than island kitchens, but packed full of usable space - like the efficient kitchen design in this version of The Gershwin. Size and layout of baths. 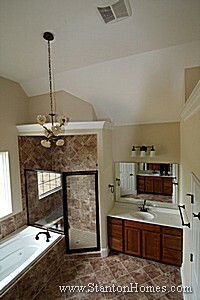 More home buyers are requesting shower-only bathrooms, like in this version of The Smokey Ridge. We're seeing more home buyers opt out of the living room fireplace. If a fireplace is on your must-have list, ask your builder to locate it on an outside wall. 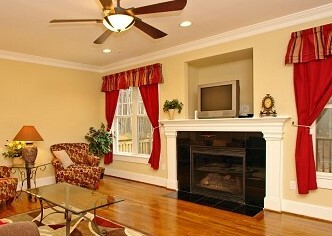 Exterior wall fireplaces are more cost effective to build than interior wall fireplaces. 2 baths vs. 2.5 or 3 baths. Bathrooms cost more per square foot than any other room in your home (besides the kitchen). Depending on the sq ft and selections, a powder room can start in the $2K range. 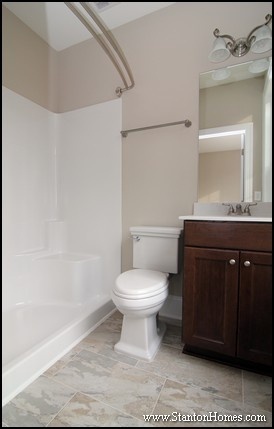 A full bath with tile and nice fixtures generally starts closer to $4K. To reduce the cost of your home, make sure you're getting the right number of bathrooms. How many bathrooms do I need? Find out here. There are many ways to build small, efficient bathrooms. Get more ideas from these 10 powder rooms for small spaces. Stay angular. Cut those corners. The rectangle footprint of The Silverwood makes it a more cost effective plan to build. 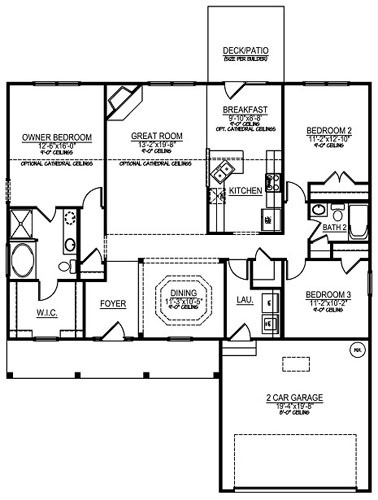 With only a 200 sq ft difference in size, each plan has three bedrooms, two baths, and a two car garage. The Silverwood is copyright Plans, Inc.
Keep the roofline a little simpler. Soaring rooflines can add expense without necessarily adding livable space. Specialty windows and rooms filled with windows. Large window designs are a top custom home request. To reduce the cost of your home, ask your builder how to cut out specialty windows, and plan windows carefully throughout the home. 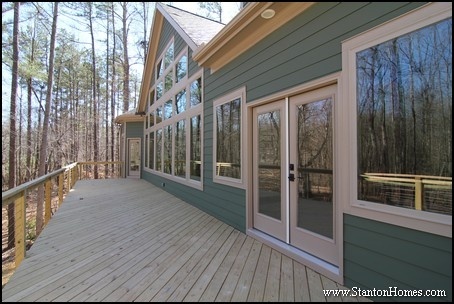 This version of The Bostwick has the best of both worlds - the design incorporates lots of windows for tons of natural light, but with lower-cost standard window sizes and shapes. Similar to bathrooms and kitchens, laundry rooms are more costly to build than other rooms, especially when a larger laundry is filled with cabinetry and countertops. See 10 small laundry room layouts, with completed home pictures, here. 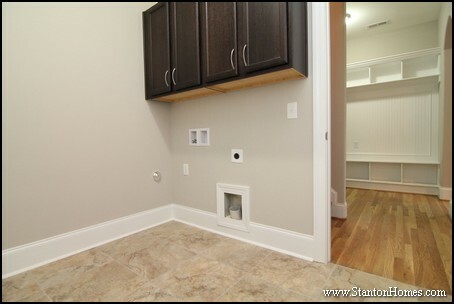 Popular floor plans often include built ins throughout the home. Adding built ins down the road can save cost up front, and give your family weekend projects to complete together. Two car, not three car. 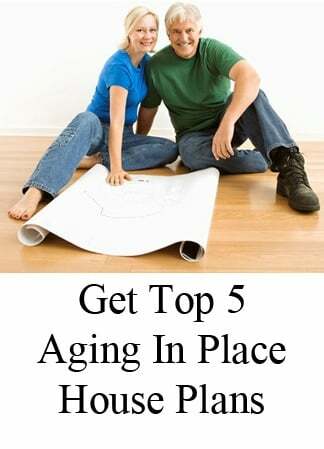 When finding ways to cut the cost of your home, one of the first things to consider is removing the third car garage. Most families find ample space in more standard two car garages, especially when nailing down true "must-haves" versus "really wants." For this version of The Dinsmore, the home owners reduced their home's footprint - and saved on building costs - by removing the third car garage. Limit the size and quantity of covered porches. The cost of porches and other outdoor living areas adds up quickly. Consider a front OR back porch, but not both, if you're looking to save money by building a smaller home. Which would you use more? That's the one you should build. Often, homebuyers decide on outdoor living spaces after buying a lot - to maximize the use of their land. 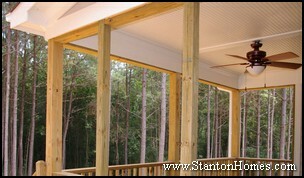 Remember - patios and decks are much more cost expensive than porches, and offer great outdoor living options. These cost-cutting tips should help your family stay on-budget when narrowing down your favorite floor plans. Ultimately, building a custom home is about quality, creativity, and personality. 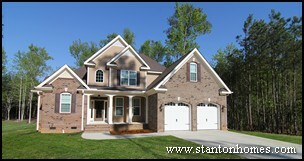 Ask Stanton Homes how we build custom homes - in budget - without sacrificing what matters most to YOU. Trey ceilings can be designed as a centerpiece or subtle accent in your new home. While some of the most popular trey ceiling styles - such as step, shallow step, vaulted, octagonal, angled, or single box - are often placed in the formal dining room or master suite, more home buyers are adding a specialty ceiling to their home office, great room and kitchen. See over 75 different trey ceiling photos and get ideas for your trey ceiling design in this trey ceiling ideabook. In this design build contemporary style kitchen, a single box trey was added to the kitchen and breakfast nook ceiling. This trey ceiling creates continuity between the kitchen and nook - and gives subtle room division in an otherwise open concept design. 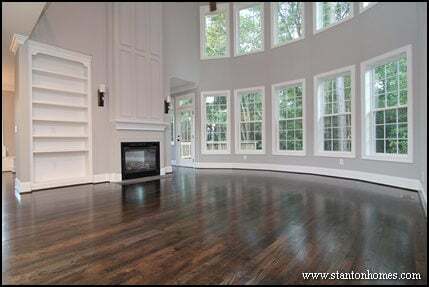 In this Raleigh custom home, an octagonal trey ceiling was included in the first floor home office, located just off the foyer. This office is perfect for at-home work and visitor reception with a complex ceiling, tranquil green walls, and tons of natural light. 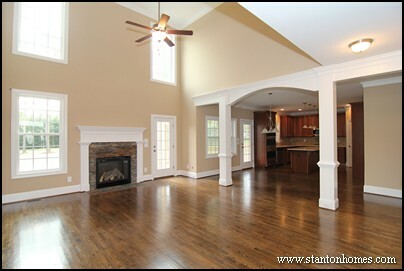 In this accessible custom home, a trey ceiling was incorporated into the living room. Here, a shallow vault draws the eye upwards, making the two-sided fireplace feel taller and more dramatic when entering the home. Misconception #1: One story homes are the least expensive home to build. The more square footage there is on the first floor, the higher the cost for typical plans. The bigger the footprint, the higher the costs are for foundation, roofing, and even framing to support that big roof. It's most cost effective to go up, rather than out. 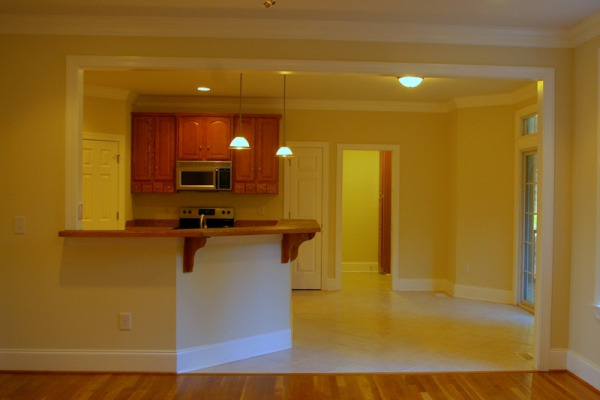 A Main Floor Master home can be a good compromise between budget and lifestyle. Misconception #2: I can save money by using other countertop types in place of granite. If you're happy with today's premium laminate options, these remain the most cost effective countertops. Want to step up your game? 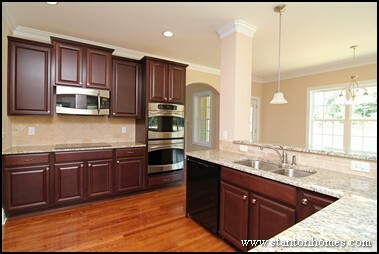 Granite countertops offer beautiful natural stone that are extremely long lasting. 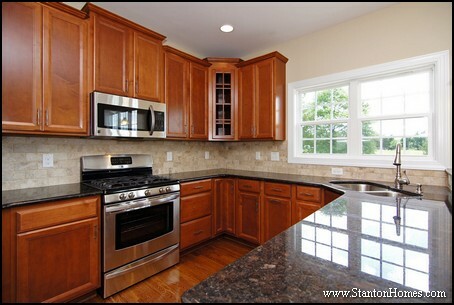 Butcher block, recycled glass, and stainless steel countertops can cost double or more the cost of granite. Quartz is usually about a 50% increase over the cost of granite. Misconception #3: There’s nothing I can do to change the floor plan other than choosing another floor plan - and I can't find a plan I like. If your builder is truly a custom builder, you can make almost endless changes to the floor plan. Often we solve problems by adding additional rooms, widening hallways, rearranging kitchens and master suites, and even completely redesigning just about anything about the home. 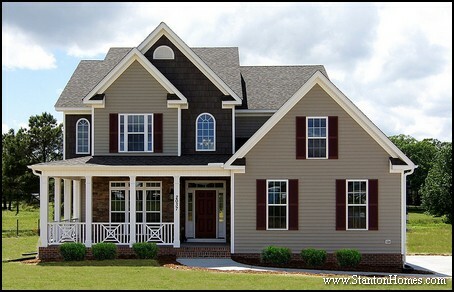 Misconception #4: The exterior of my home will need to look just like the picture. A truly custom home can have a totally different exterior than the one in the photos. Start by choosing a floor plan you love - and ignore the exterior, if you don't like it! 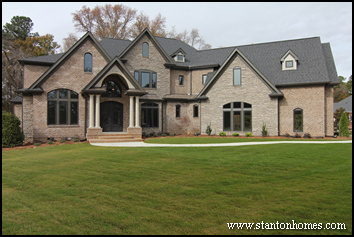 Stanton Homes can make your home have any design from Craftsman, Traditional, Transitional, Victorian, to Country and many other architectural styles you like best. Misconception #5: I have to buy a lot before I can build a custom home. Financial institutions will work with you to wrap your lot loan into your construction loan, so it’s all one easy payment that will roll over into a mortgage. In many cases, it may be much more beneficial to contract the home and lot together, as some lenders require that a lot be owned for 12 months before equity can be counted. Talk to your builder and your lender BEFORE you purchase that lot. Misconception #6: The home I want to build is too big for the lot I like, so I’ll have to look for another neighborhood. Maybe… but we’ll take a look at the lot you like before you make any decisions. It’s possible that we can redesign your floor plan to fit a lot you love. Misconception #7: It’s really hard to find a lot for my new home. 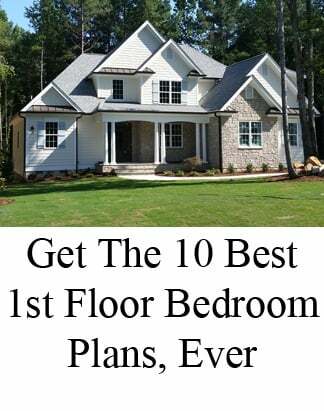 Start with the links on our website to some of the communities all over central North Carolina where we can build your custom home. Any unrestricted lot available on MLS can be available for a custom home – and we’ll help you choose one that’s a good fit. Misconception #8: As long as there are other homes in a neighborhood, the lots that are left should be good to build on. Ask for a builder lot inspection. Things such as easements, lot characteristics and topography and other factors could impact what and where you can build. Never buy a lot without knowing (and understanding) the details regarding sewer or septic and water or well. If the lot has not been "perked" or there is no septic permit on file, discuss with your builder BEFORE you purchase the lot. And if there is a septic permit on file, show it to your builder - he'll let you know if the system is typical, or more expensive. Misconception #9: If I choose a floor plan with less square feet, it should be cheaper to build. Costs are dependent on a great deal of factors, not just square footage. The number of windows, size and complexity of the kitchen and baths, number of baths, architectural complexity, and even the number of "corners" all affect cost. Ask your builder for a full, comprehensive estimate for the home you're interested in - and ask for suggestions for alternate designs that fit your budget. Misconception #10: A bigger home costs more per square feet than a smaller home. The bigger the home, the less it typically costs per square feet. A lot of factors stay the same no matter what size the home is, especially site costs, permits, and impact fees, among others. Of course the complexity and style of home still factors in too! Misconception #11: Engineered hardwoods are better than site finished hardwoods. This is a personal decision. Although engineered hardwoods can start out with a tougher finish, they cannot be sanded down multiple times over the years ahead should you choose to refinish your floors. 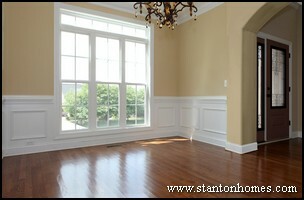 Stanton Homes gives you the choice, and we will detail all of the differences to you when you make your selections. The choice that is selected most often is site finished. Do be wary though - some builders offer "hardwoods" that are merely laminates, and don't stand up to either engineered or site finished standards! Misconception #12: If I add a lot of windows to my home that will make it less expensive, because glass costs less than other materials. 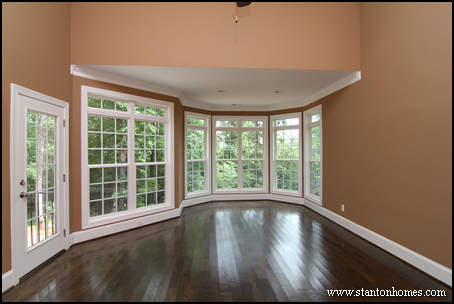 Windows can add extra light and personality to a home. But the more windows, and the more complex the windows are, the higher the overall cost of the home. Keep in mind too - glass does not keep heat in or out nearly as well as an insulated wall, no matter how good the windows are. A home with a lot of glass will be more expensive to heat and cool (and likely require a larger and more expensive HVAC unit too). Ask your builder for the best ways to get more light into your home, without breaking the bank. 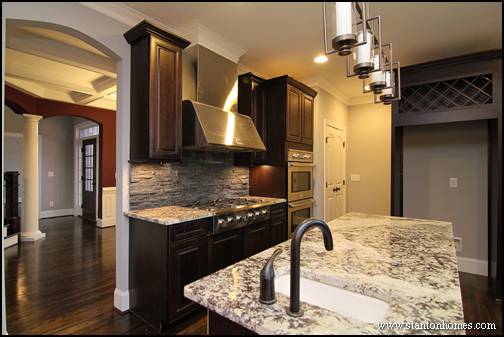 Misconception #13: I do not have the time or expertise to select good features and finishes in a custom home. With Stanton Homes, a professional designer will work with you to choose your selections with eight extensive design sessions. You will be accompanied to all of the warehouse visits so that every aspect of your home is coordinated. You can be involved as much, or as little, as you'd like to be in the process - we'll coordinate everything for you if you'd like, or give advice every step of the way. Misconception #14: It’s really hard to get a construction loan. New home construction is booming and the banks are backing it. We work with dozens of financial institutions that offer a wide variety of programs, with everything from 5 – 20% down, so we suggest that you call several to see what works best for you. We'll be happy to provide a full list of lenders! Misconception #15: I'm going to need to walk through a home that's exactly like what I want, so I can be sure I'm going to like it. The only way to walk through a home that's exactly like the one you want to build is to have a home just like everybody else has. But usually that means you're looking at a manufactured model, that's loaded up with high end extras that add a tremendous amount of cost to the "base plan" you won't be able to visualize, anyway. You can get a pretty good idea of how beautiful your custom home will be by taking a look at other homes your builder is creating. 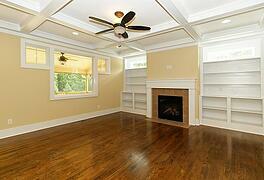 Look at lots of photos and ask to take a tour of homes in progress. Ask a lot of questions, and find out what your builder team will do to weave your influence into your new home. If you've chosen a great builder, you'll be excited. Can't find it? Design it! It’s still a little dusty, and we’re still doing final touches: What a great time to see how we design and build real homes for real people. 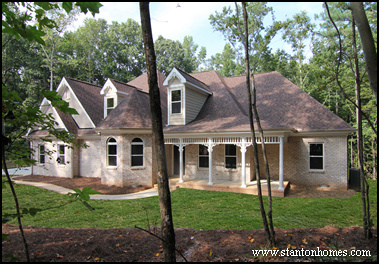 Here’s a sneak peek at a Stanton Home we’re completing right now, to give you more ideas fresh from the building site. Tell us what you like best, and we’ll show you how to build it into your favorite floor plan. Design with detail – and the pleasure of formal dining. A carefully chosen color palette for archways and trey offer a natural flow. 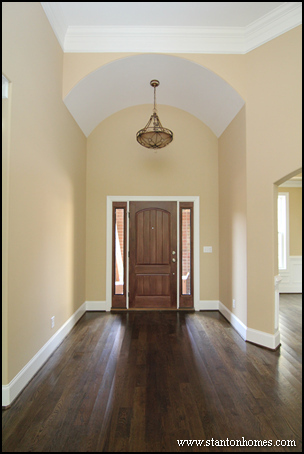 Add depth to your foyer with a barrel vault ceiling. Add dimension in every direction with open corridors and natural light. 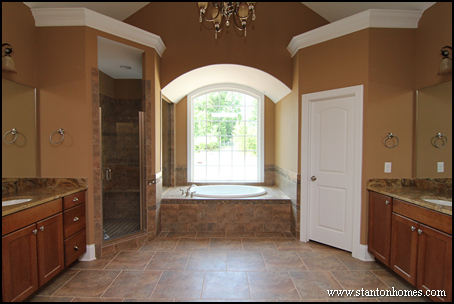 Build a master bathroom that feels like a spa. Create some excitement - design and build your custom home with everything just the way you want it. How much are property taxes for Cumberland County NC new homes? Where is Cumberland County located? Cumberland County sits below Harnett County, about an hour south of Raleigh. 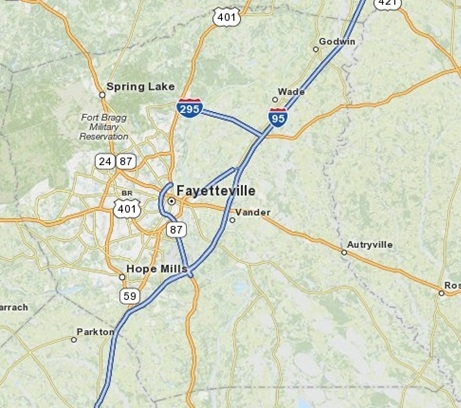 Towns within Cumberland County are particularly popular with families looking to stay near Fort Bragg and Fayetteville, or to have affordable country living just a short hop from big city life in the Triangle. Cumberland County encompasses Falcon, Fayetteville, Eastover, Godwin, Manchester, Spring Lake, and Wade. 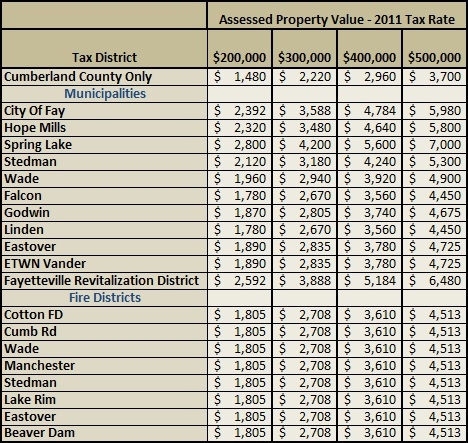 How Much are 2011 Property Taxes in Cumberland County, NC? 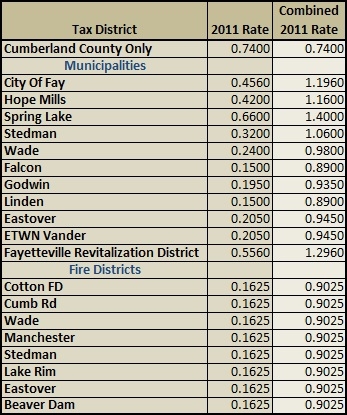 Here are the 2011 rates, by town within Cumberland County. To get the total property tax rate for a town, simply add the county tax to the town tax. For example, Hope Mills has a town rate of 0.42, and the Cumberland County rate is 0.74. Add the two together - the total tax rate for Hope Mills, NC is 1.160. The Cumberland County property tax chart is not as confusing as it looks. The tax rates are always based on the assessed value of the home, not the asking price, so you'll want to look up the assessed value, or ask your agent for it. This table gives sample property tax bills for all the cities in Cumberland County, such as Falcon, Fayetteville, Eastover, Godwin, Manchester, Spring Lake, and Wade. There is no guarantee that tax rates will remain the same - check the Cumberland County Property Tax Page for most recent information. If there's a particular home that you're considering, you can go directly to the Cumberland County Tax Records Site, type in the address, and see the assessed value of the property. If there is a discrepancy, don't be afraid to ask your real estate agent to pull comps for you! What Are Beadboard Ceiling Treatments? 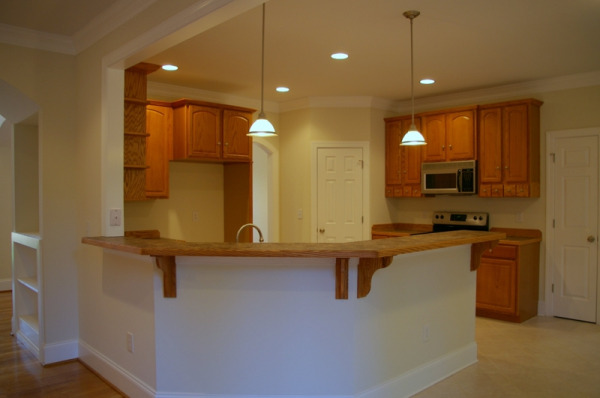 Check out these Raleigh custom homes with beadboard ceiling treatments. Beadboard treatments are a classic feature - and they are being added to more transitional (not just traditional) style new homes. What is a Beadboard treatment? Beadboard, also referred to as "tongue and groove," is a treatment (usually a ceiling treatment) that gives a routed design to previously flat panels or flat wood coverings. Beadboard treatments give the home a traditional, classic look. A Beadboard design is incorporated into this covered front porch. What is Beadboard made out of? A Beadboard Treatment can be created using individual wooden planks (commonly pine, cedar, or even plywood), beadboard panels, or even vinyl. Generally, individual tongue and groove boards will be more costly than full panels, and stain grade beadboard will be more costly than paint grade beadboard. Beadboard can be either painted or stained, depending on the materials used. Beadboard is commonly painted white, stained a natural tone, or left in its natural wooden state. Where can Beadboard be used in a home? Beadboard is not limited to porch ceilings. In fact, it can be used throughout the home, including on foyer and sunroom ceilings, on kitchen cabinet doors, and as on wainscoating for hallways, dining rooms, mudrooms, and bathrooms. 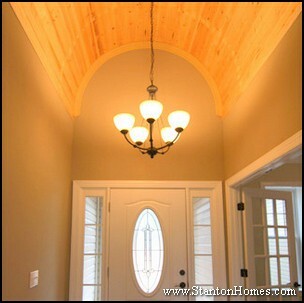 Check out this Barrel Vault Foyer with natural wood Beadboard Ceiling. This custom home foyer incorporates two elegant features into one area, creating a personal style and dramatic entranceway. Whether you are building a new home, or looking to make some changes to your current home, Beadboard ceiling treatments and wainscoating designs can be a unique addition to any room. Want to read about other popular Custom Home Trends? "Meet the Builder" Open House with trim detail experts! 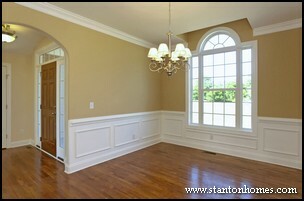 Learn How to Add Wainscoting to Any Room! 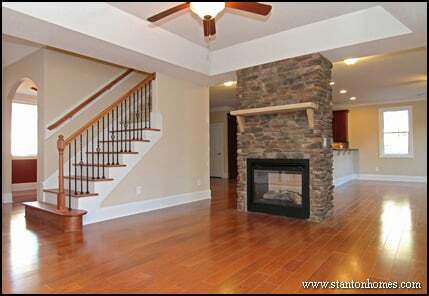 Watch a photo tour of Raleigh new homes with wainscoting treatments here. Learn more about building a new custom home! 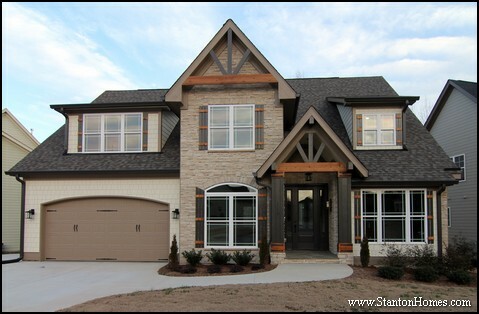 This Stanton Homes "Meet the Builder" trim and detail event will be held at a new custom home under construction, in Arbor Commons in Holly Springs, just off Main Street and Sunset Lake Road. Come by and learn, step-by-step, how easy it is to install wainscoting in any room of your home! The experienced custom home builder team will teach you exactly how to prepare and install these three different kinds of wainscoting in just a few hours! 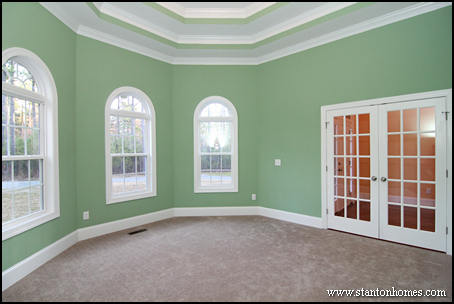 See for yourself how you can transform any room in just one weekend, with a few tools and some home center trim! 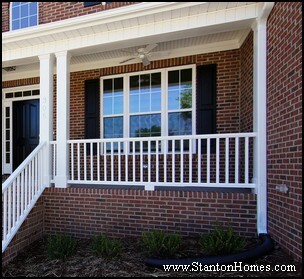 Stanton Homes "Meet the Builder" drop- in events are an informal opportunity to talk with one of the Raleigh-Durham region’s top builders about the little tricks it takes to make your home special. 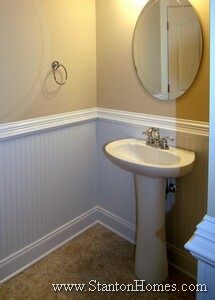 Wainscoting is a lower wall treatment that adds a more upscale, formal look to a room at minimal cost. 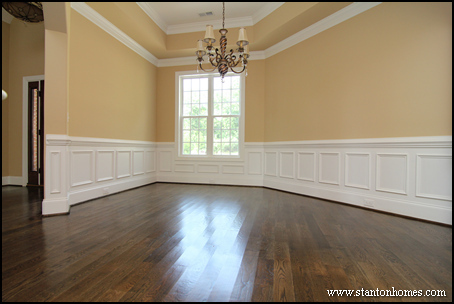 Wainscoting usually consists of three parts: chair-rail molding, baseboard, and a series of design pieces in between. 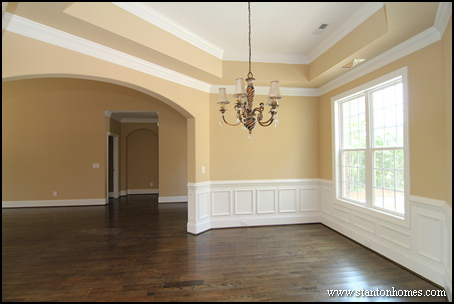 What is Picture Frame Wainscoting? Also called Shadow Box Wainscoting, this treatment consists of “boxes” created by adding “picture frames” of trim work underneath the chair rail treatment. What is Ladder Rail Wainscoting? One of the easiest do it yourself treatments, ladder rail wainscoting is vertical trim tacked up in a series of steps, ending at chair rail height. Beadboard wainscoting consists of panels installed between baseboard and chair rail, with interesting texture and grooves. 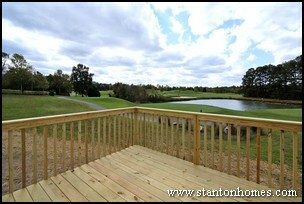 Call 919-278-8070 or email info@StantonHomes.com for more information. 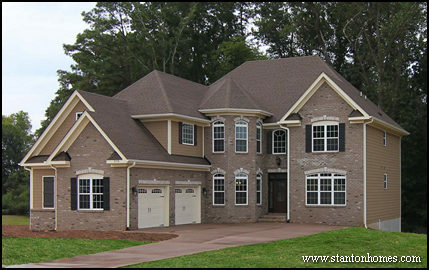 Need more information about building a new custom home? 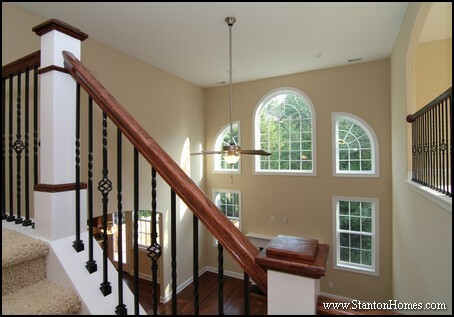 Bring a copy of your floor plans, or contact us ahead of time at Info@StantonHomes.com or 919-278-8070 for a full, free building cost estimate of the plan you have in mind. 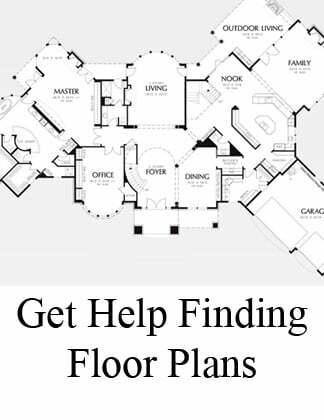 Let us know what you're looking for, and we'll send you floor plans that meet your exact specifications. 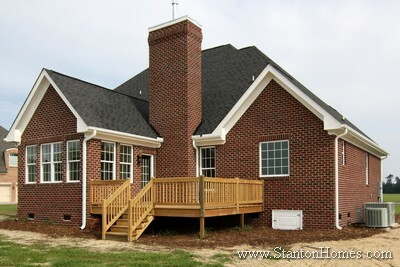 Stanton Homes' Build On Your Lot program Stanton Homes can also help you find a lot in a beautiful custom home community or on acreage, with our Stanton Homes’ Build On Your Lot program. Need more storage space for all those Costco-sized containers? 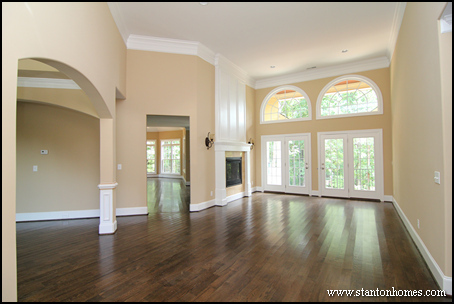 Ask your custom home builder if they can move or expand that pantry in your new home. The answer is usually “yes.” In fact, when you work with a custom home builder like Stanton Homes, you can do a lot more adjusting to that floor plan than y ou may realize. Here’s an example. 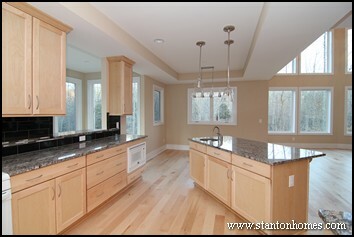 The kitchen area in this floor plan was the only part of the home that the people who chose it weren’t excited about. They wanted to know what a custom home builder could do with it. The laundry closet impacted space in the breakfast room, and the kitchen felt small because of the entrance door to the garage. As always, Stanton Homes was able to make changes at little to no cost, as long as the changes were requested in the planning stage. As you can see in this view from the family room looking into the kitchen and breakfast room, the custom home builder added a bay extension to the breakfast room, creating a much more open feel. A full size laundry room was moved into the oversized garage, which is now accessible through the laundry room. This eliminated the need for the original second doorway, and opened up a lot more usable space. This is a view diagonally into the kitchen. 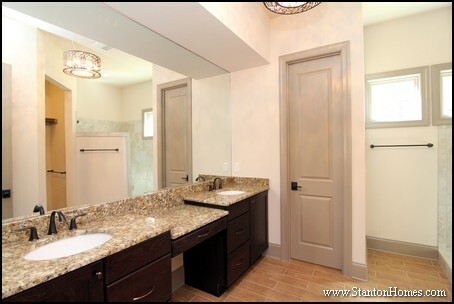 The custom home builder added a full walk-in corner pantry, by shifting cabinets to the right. This created a second pantry - the original pantry space still exists – the custom home builder just bumped it into the garage to allow for more space in the kitchen. The cost difference was minimal. The structural changes for the expanded laundry only called for some additional framing materials. The actual floor surface stayed about the same, with only a slight increase in tile cost. No additional windows were added to the bay. Even though the cabinet arrangement was a lot better, the actual cabinet package remained the same. There was a slight cost for additional framing for the corner pantry and its additional shelving. 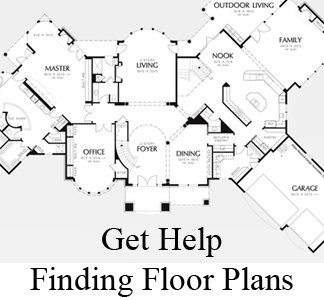 Tell your custom home builder what you’d like to see different, on your favorite floor plan. When no structural changes are required, it may be easier than you think to build your new home exactly the way you want it. Article copyright Stanton Homes 2010, all rights reserved. 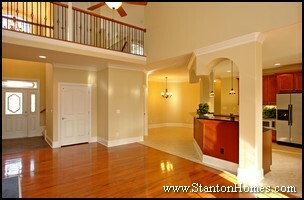 Provided for informational purposes only, no claims are made by Stanton Homes regarding the validity of any statements. What Kind of Fireplace Should You Choose for Your New Home? When th e air starts getting crisper, you might find yourself yearning for a woodburning fireplace. But you’ll need to check with your custom homebuilder to see whether they can add a woodburning fireplace to your new home. Materials, cost, and even where you choose to live could have an impact. Some districts no longer allow installation of woodburning fireplaces, due to air pollution issues. Check with your custom homebuilder to find out where they’re allowed, before you choose your lot. 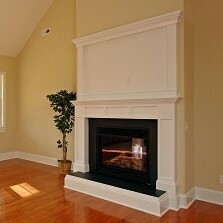 A woodburning fireplace usually costs more than a gas fireplace. The firebox must be built to withstand higher heat: Wood is hotter than gas. Custom homebuilders will make sure that the fireplace vents directly to the roof instead of through the wall, the way a gas fireplace does. Thus the chimney must be taller – which adds to the cost of building. Today's woodburning fireplaces usually consist of a woodburning insert with a metal flue that reaches the roof, but this is still more expensive than a gas fireplace. Woodburning fireplaces are intended for the burning of wood – and that can take more effort than you realize. Even if your property has a lot of trees you’re planning to chop into firewood, you need to make sure your community allows you to do that. If there’s a Homeowners Association, check the rules to make sure you’re allowed to take down the trees. Woodburning logs are getting harder to find, and when they’re sold by the bundle, they can be expensive. Ask custom homebuilders if they’re aware of local costs and availability for a truckload of wood to be delivered to your home, if you’re unable to get it, yourself. Keep in mind that with a woodburning fireplace, you'll need to store wood somewhere. Storing wood in preparation for burning can attract insects or rodents. If you store wood too close to the home, those critters can get inside. You’ll also need to protect the wood from the weather – too much rain will make soggy logs difficult to burn. Local restrictions can include special rules for days when air quality is low, due to pollution. When this happens, you may only be allowed to light a fire if you have a gas fireplace – which doesn’t have as many emissions that affect air quality. 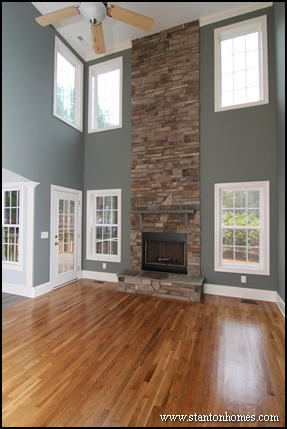 It isn’t always possible for custom homebuilders to put a woodburning fireplace where you think it might be fun in your new floor plan. Because a woodburning fireplace has to have a vent that goes straight up, the home needs to be designed with that in mind. Gas burning fireplaces have more options - and have a much lower installation cost when place on an exterior wall. Due to the extra heat involved in burning wood, you also may not be able to add a recessed entertainment center above a woodburning fireplace, like the one seen here. 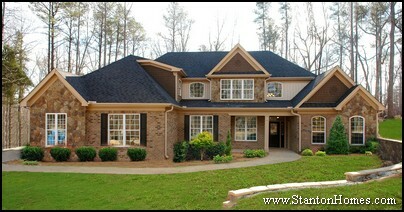 Ask your custom homebuilder what the best option is in your area. 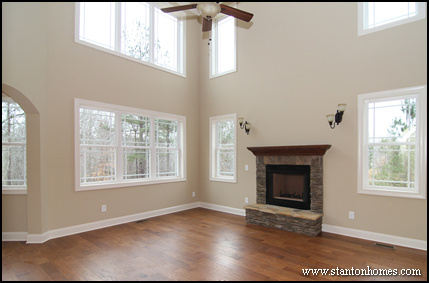 Give custom homebuilders the floor plan you're considering, and let them know what area you want to live in BEFORE you buy a woodburning fireplace.